William Tyndale was born in England in 1484 and was murdered for his faith in God and Scripture on October 6th, 1536. He went to school at Oxford and afterward to Magdalen Hall and Cambridge, and about 1520 became tutor in the family of Sir John Walsh, at Little Sodbury in Gloucestershire. He become attached to the doctrines of the Reformation and devoted himself to the study of the Scriptures. The open avowal of his sentiments in the house of Walsh, his disputes with Roman Catholic dignitaries there, and especially his preaching, excited much opposition and led to his removal to London (about Oct., 1523). There he began to preach, and made many friends among the laity, but none among ecclesiastics. Tyndale sought to translate the Bible entirely from its original languages into English so that common people would be able to study from it. In London he was aided by Sir Humphrey Monmouth and others in his work to translate the Bible into English. He was, however, unable to do so in England, so he set out for Europe (about May, 1524), and appears to have visited Hamburg and Wittenberg. But the place where he translated the New Testament, although conjectured to have been Wittenberg, can not be named with certainty. It is, however, certain that the printing of the New Testament in quarto book size began at Cologne in the summer of 1525, and completed at Worms, and that there was also printed an octavo edition, both before the end of that year. 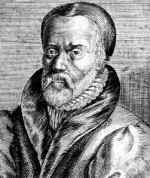 A seemingly impenetrable mystery overhangs the life of Tyndale during the interval between his departure from Worms and his final settlement at Antwerp. His literary activity during that interval was extraordinary. When he left England, his knowledge of Hebrew, if he had any, was of the most rudimentary nature; and yet he mastered that difficult language so as to produce from the original an admirable translation of the entire Pentateuch, the Books of Joshua, Judges, Ruth, First and Second Samuel, First and Second Kings, First Chronicles, contained in Matthew's Bible of 1537, and of the Book of Jonah. The Authorized (King James) Version was based heavily on Tyndale’s work. His Biblical translations appeared in the following order: New Testament, 1525-26; Pentateuch, 1530; Jonah, 1531. Impressed with the idea that the progress of the Reformation in England rendered it safe for him to leave his concealment, he settled at Antwerp in 1534, and combined the work of an evangelist with that of a translator of the Bible. Tyndale was betrayed by Henry Philips, an agent of the Roman Catholic Church and the King of England, which sought to kill Tyndale as a heretic and traitor for translating the Bible into English. He was arrested and imprisoned in the castle of Vilvoorden, tried and convicted; was first strangled, and then burnt in the prison yard, Oct. 6, 1536. His last words were, "Lord, open the king of England's eyes." As an apostle of liberty, he stands foremost among the writers of the period, whose heroic fortitude and invincible love of the truth were heard with a force superior to royal and ecclesiastical injunctions; and the very flames to which fanaticism and tyranny consigned his writings burnt them into the very hearts of the people, and made them powerful instruments in attaching and converting multitudes to the principles of the Reformation. It is not exaggeration to say that the noble sentiments of William Tyndale, uttered in pure, strong Saxon English, and steeped in the doctrines of the Gospel, gave shape to the views of the more conspicuous promoters of that grand movement, who, like himself, sealed their convictions with their blood. William Tyndale's early English translation of the Bible is part of the SwordSearcher Bible Software study library.